This Deluxe R-100 boxe stores and protects 100 rounds of rifle ammunition. It comes with an inner tray for two height positions to fit more cartridge lengths. 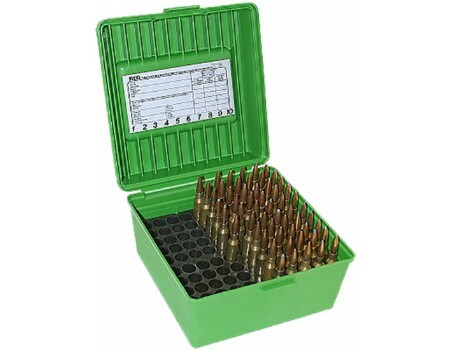 Bullets can be stored up or down for most calibers, and when in the down position, rounds are protected from tip damage. It has a folding handle and are made from virtually indestructible polypropylene with a scuff-resistant, textured finished that will not crack, ship, contract, expand or warp along with MTM's integrated 'living' hinge and a Snap-Lok latch.